Figure 46. Sector structure of the solar magnetic field. The data are for December 1963 to February 1964. 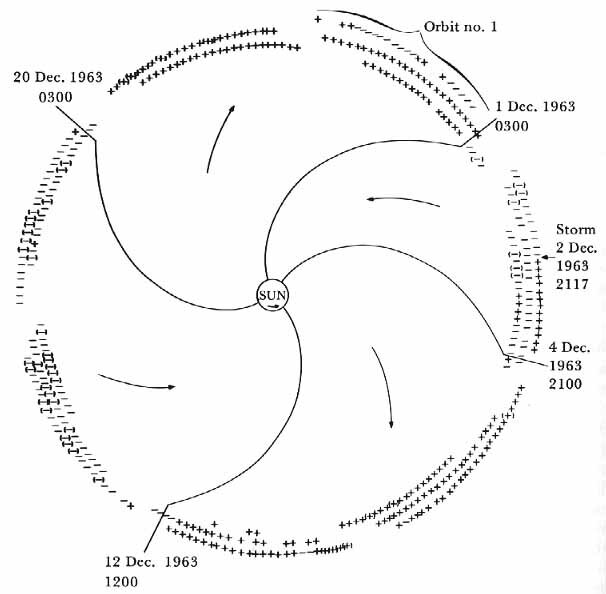 The direction of the average experimental interplanetary magnetic field during three-hour intervals is denoted by plus signals (away from the sun) and minus signs (toward the sun). Parentheses around a plus or minus sign indicate that the field direction fluctuated significantly. The solid lines represent magnetic field lines at sector boundaries. Alois W. Schardt and Albert G. Opp in Significant Achievements in Space Science, 1965, NASA SP-136 (1967), p.42.